Although I chose to hike on a weekday afternoon to reduce encountering off leash dogs, I knew we might encounter one or two. Chester and Gretel are what you call “reactive” dogs – an off-leash dog running up to them, especially when they are leashed, scares them. I rounded the corner and saw two larger dogs, both off leash. Their owner was nowhere in sight. I pulled Chester and Gretel to the side and stood between them and the other dogs. Based on past experience, I knew this was a way to reduce Chester and Gretel’s anxiety while sending a signal to the other dogs, and the owners if they were around, that my dogs needed some space. It was working too – Chester and Gretel stood there calmly. Out of the corner of my eye I could see the two off-leash dogs approaching, owners still nowhere in sight. I crouched down and kind of hunched over Chester and Gretel. As the off-leash dogs approached, I got closer to the ground and formed a little “bubble” over them with my body. Chester and Gretel were still being quiet. The nerve! I was speechless. I mean, I was following the law and had my dogs on-leash. These people apparently had no clue what “aggressive” vs. reactive/defensive dog body language looks like or, at the very least, misunderstood Chester and Gretel’s actions because they did not see their dogs barging in on my dog’s space. Before you think this is turning into an article bashing off-leash dogs, it’s not. I think that dogs off-leash anywhere they are legally allowed is acceptable. I’m also ok with dogs off leash where it is required by law (aka. the owner chooses to ignore it) as long as they are well-trained to respond when their owner calls them back and the owner is willing to leash them temporarily when other dogs and people pass. The other dogs were not leashed. – The trail we were on, and most of the trails we hike, legally require dogs to be on a 6 foot leash. The owners did not leash their dogs. The owners were not in sight to call their dogs back. – In some cases, “voice control” is an effective alternative to a leash. However, an owner must be able to see their dog, and the dog must return to their side as soon as they are called the first time, for them to be considered under voice control. The owners let their dogs get out of their sight so they had no control over them. We were in a “confined space” – Most people wouldn’t think of a trail as a confined space but it is. A confined space is any place that has limited or restricted means for entry or exit. On most trails, it’s narrow and only has two directions of “escape” – forward or backward – because there may be vegetation or a hill on either side of the trail. This gives a dog no choice but to be in close proximity with a strange dog and the forward “exit” is usually impeded by this other dog. The two dogs did not respect our space. – They did not recognize my “go away” signals and forced their way into Chester and Gretel’s space. Chester and Gretel are reactive. – They perceived the other dogs as a threat, were fearful, and they started barking in an attempt to make the threat go away. Although their behavior could have been interpreted as aggression, the sole intent was to make the other dogs go away. I don’t blame the other dogs at all. To me, whether a the dogs were off leash or not is irrelevant. The whole situation could have been avoided if the people had been close enough to see us approaching and called their dogs away. They weren’t. 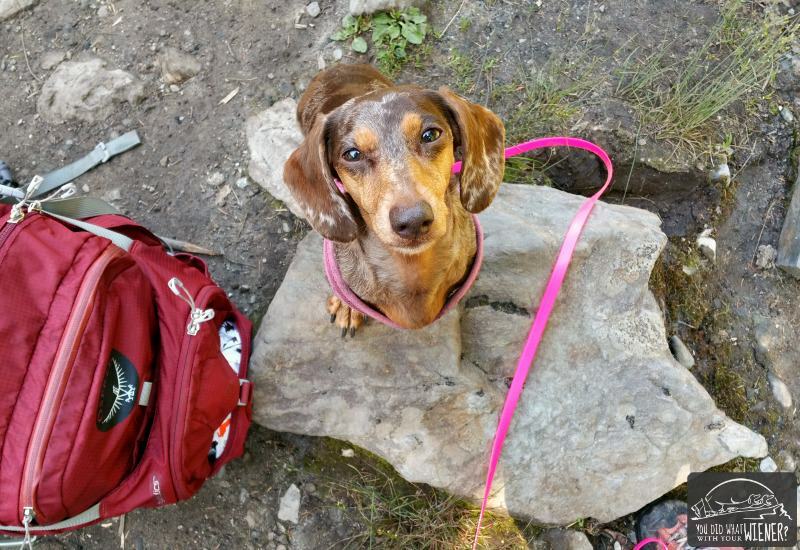 Related: Trail Etiquette When Hiking With Dogs – Don’t Be a Jerk. Your dog’s problem is not my problem – that they don’t have to change the way they do things because your dog might get upset. If your dog can’t act nice and calm around all dogs, no matter what the situation is, then they don’t belong out in public. Sadly, most of these people’s minds will never be changed. It’s not that they “just don’t know better”, they just see it as something you need to deal with, not them. So, as the owner of a reactive dog, what can you do? 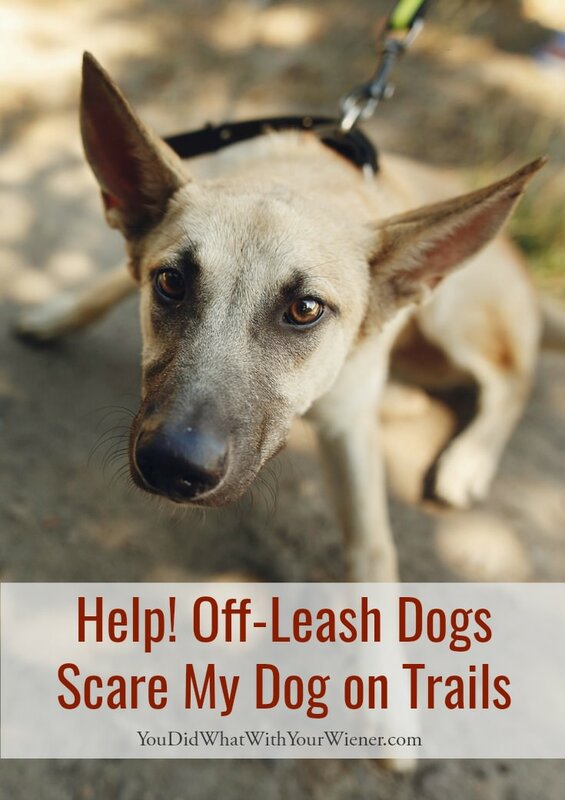 My friend, who has traveled to several other countries with her dog, wrote a great guest post for me – 7 Tips for Handling Off-Leash Dogs While Hiking. 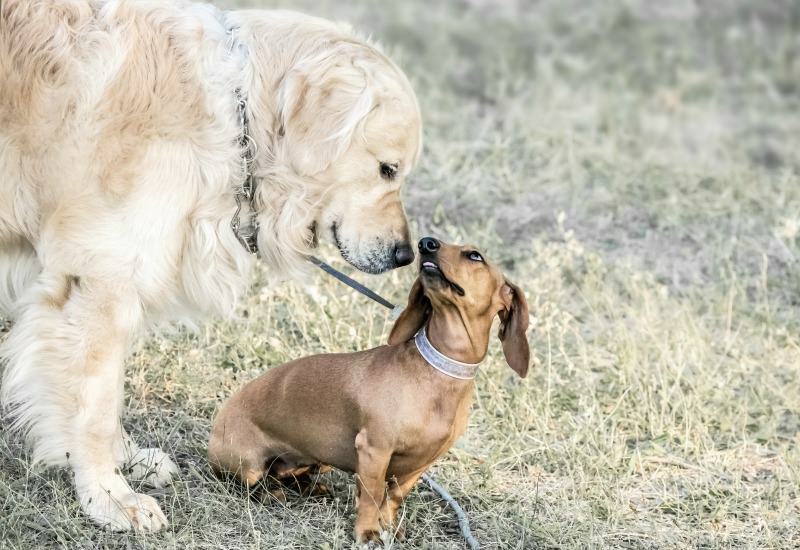 In this article, she explains how you can assess a situation to avoid any potential conflict and how to send signals to the other dogs (and their people) to leave you alone. They are super great tips! However, there is a second part to the equation; What to do with YOUR DOG when you see an off-leash dog approaching. The first way to be proactive is to choose a trail that doesn’t see a lot of traffic, especially if you know you’re likely to encounter off-leash dogs. Do: Remain calm. If you get scared and stressed out, your dog can sense that and is more likely to get riled up. Do: Step as far off the trail as you can without damaging vegetation and face your dog. Sometimes you may have to backtrack to a wider spot in the trail. Do: “Body block” by standing between your dog and the off-leash dog to help show them that you have control of the situation and break up their line of sight. Do: Teach your dog to sit calmly when other dogs appear (or at least stand calmly… Chester and Gretel don’t like setting their tushies on dirt). Do: Get your dog to focus their attention on you and reward them for calm behavior. Treats and/or a clicker can help with this and training this behavior should begin at home. Do be aware that treats have the potential to make the problem worse (although treat distraction is the method I use and it rarely is) because the approaching dog may smell them and come closer. However, to me, the benefit outweighs the risk. Do: Call to the other owners to let them know that your dog isn’t friendly around other dogs. There is a chance that the other people may not take that has a hint to keep their dog away or care (again, your problem, not theirs, in practice) but I’ve found that most people will at least attempt to call their dog over to them. If you tried all of the above and you can tell your dog is getting upset and is likely to “lose it,” you can actively try to shoo the other dog away. Another trick that works for me is using the “leave it” command and quickly shuffling by, or jogging by, the other dog. Many of the skills you and your dog will need to avoid any issues on the trail are best addressed at home first so you can use them on the trail when you need to. 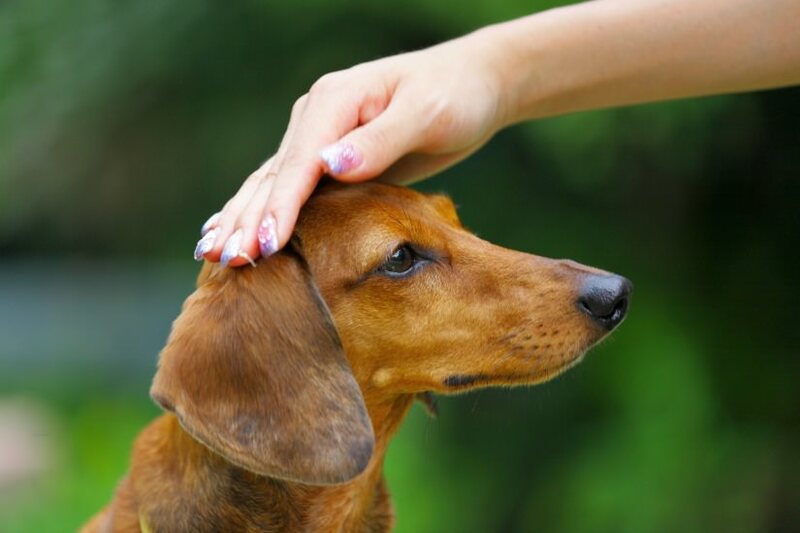 Desensitization exercises – The “look at that” game, and the getting closer and closer without reacting, will help your dog be more comfortable when seeing or being near strange dogs. Try a reactive dog class if you need some help. Learn to read dog body language – Both your dog’s and others. We live with our dogs every day so learning their signals, and what sets them off, is sometimes intuitively learned. Those same signs and signals aren’t necessarily the same for all dogs. Take a class that teaches you how to recognize universal dog body language or do some online research. Use a natural calming supplement – Although some may disagree with me, I don’t think there’s anything wrong with giving your dog a natural calming product to help them keep their cool. I give Chester and Gretel Hemp CBD Treats and/or Vetriscience Composure Chews (affiliate link) if I think we’ll be in a stressful situation. It doesn’t drug them or make them loopy, or affect their ability to exercise, but it does take the edge off so they can focus on my signals. The cold, hard truth is that YOU are your dog’s best advocate and it’s your responsibility to keep them happy and safe. It’s nice when other people who hike with their dogs are respectful, but it shouldn’t be assumed that they will be. I don’t go for a hike assuming that they won’t, but I know that their aren’t obligated to behave in a way that makes it easier for my dogs. Absolutely agree! And dog owners need to remember that “on leash” means dog on one end owner on the other. We were walking in a park that requires dogs to be leashed. I could see another person with their dog walking a good distance away. The terrier was on leash, but the owner was just letting the dog drag the leash on the ground. No, the dog did not just pull the leash from the owners hand, that happens sometimes, but not in this case. When the other dog spotted mine, he came charging towards us. My dogs wrapped around my legs trying to get away. The owner just yelled “He just wants to say Hello, he doesn’t bite.” The owner came and collected their dog and we cut our walk short. As we were driving away, the terrier was again walking and dragging the leash. Yikes! Glad no one was hurt. I do let Gretel “off leash” on rare occasions by dropping the leash. It’s usually at the beach and when no one else is around. I leave the leash on her because she is fast and short. If she was to take off running, I could chase her and stomp on the leash (she’s gone as quickly as it takes me to bend down and try to grab her). We have a dog who is non agressive and he loves hiking in the woods. He is very well behaved, but he is fearful when other dogs approach him and are off-leash. Often times their owner’s will say, oh he or she is freidnly, but not all dogs like to interact with strange other dogs. Additionally, since our dog is preperly leashed he can’t remove himself from the situation. The owners who keep their dogs off leash are also being incosiderate to people who are not comfortable with dogs and with the wildlife in the woods. And more than half the time, we are pretty much made to feel that it’s our problem our dog is fearful, but we are the ones following the posted rules. Thanks for an excellent article Jessica! You fairly described all of the issues and summed up the opinions of those involved quite well. I know how strongly I feel about these issues because I have an aggressive pup, all of 5 lbs that will take on anything that comes her way, but I can’t imagine how much more frustrating it is for owners who have reactive pups. I’m looking forward to trying some of the tips you recommended. Even after weeks with a trainer my chorkie is still a meanie, but I hold on to hope. I’m truly fearful for my dog’s life when we go on walks and realize that she is a large part of the problem, so I’m always looking for new methods to try. Thanks for all of the tips! I have joked over the years that if I wanted an easy dog I should have gotten a Lab 🙂 Dogs that aren’t by nature calm and happy are always a work in progress. It sounds like you are being responsible and doing the right thing. Excellent post! And so sorry Chester and Gretel had to put up with such rude behavior. I do walk Honey off-leash in safe places. What that means is that she stays within about 20 feet or less of us at all times. I also call her to me and clip her leash back on any time we see someone else on a trail or beach. We constantly train her to be responsive to us even with temptations. If her mood of the day makes it hard for her to listen, she stays on leash. Not sure why people think “off-leash” means being totally disconnected with from your dog. Such a helpful post, thank you! If only we could get the off-leash dog owners who think it’s not their problem to cooperate 😉 My dog is a large, senior, Husky/Malamute and he hates off leash dogs – especially young and bouncy ones. I haven’t come up with a way to get him to stay calm unless I see the other dog before he does and I am able to walk in a different direction. If he sees the other dog and reacts it’s no fun for either one of us! I will look for reactive classes in my area and see what I can find. Hi Ana. I hope you can find a reactive dog class. I think one of the biggest benefits of a class like that is instilling confidence in you. A good class will also help your dog feel more confident so they don’t get so upset. Good luck. Great article and I totally agree with all points. I have two daschund mixes and one my most recent rescue is dog reactive. Although I have to admit she is better off leash, but she will growl first and you just do t know how the other dog will react. When she is scaredmy other dog becomes protective. I love all dogs but I do not appreciate owners who are clearly not in control of their dogs. And as happened to you , blame you for having your dogs under control. One more tip I also find talking to the strange dog and putting out my hand sometimes diffuses the situation, if I am not afraid or tense my dogs sense it more. Yes, good tip. The article I linked to about handling off leash dogs mentions that one. Like you said though, staying as calm as you can goes a long way when influencing the situation. Great article! I have two reactive dogs and people just don’t get it. Their dogs do not need to be in my dog’s space! I also use the same suggestions you have about keeping my dogs safe and away from the approaching dogs and it seems to work most of the time. I have one non reactive dog and I still don’t want other dog’s in her space because I do not know or trust other dogs She’s been attacked by the person’s dog that said: “Don’t worry my dog is friendly!” Luckily she never suffered any issues, physical or mental, but I’m not willing to take a chance. Thanks Tanya. You are right. A lot of people just don’t get it. I didn’t until I owned a reactive dog myself. I agree that it’s good to keep one’s dog out of another’s space unless they are invited (like asking the owner first). I am happy that I see more and more people being respectful of a dog’s space but pet owners still have a long way to go. I have a dog who HATES being approached by off leash dogs. He becomes agitated and frightened and it takes a real effort to control him. Unfortunately, despite laws and regulations to the contrary, no one in my neighborhood will leash their dogs, most of whom are NOT friendly off leash (I’ve been rushed and nearly bitten by off leash dogs 4 times, including once by a dog whose owner screamed at me and called me profane names for daring to be upset that her dog attacked me). I can’t walk my dog nor do I even feel safe walking by myself in my own neighborhood. Thanks to all of this, I am absolutely phobic about off leash dogs now. No, I can’t talk to my HOA about this… the president of it never leashes his dog. I’m sorry your experience with off-leash dogs has been awful. I really, really don’t get it when a person’s dog has had negative interactions with other dogs before and they STILL don’t leash them or be careful to respect another dog’s space. These are great tips! I’m always shocked at the lack of knowledge of body language some pet owners have. I’m no behavior expert, but I can certainly recognize when a dog is not happy or feeling threatened. I have a super alpha female who’s very selective about who she is friendly with, so I appreciate when dogs are leashed where I expect them to be (i.e. where it’s the law) I made the mistake once of getting between her and a off-leash dog that came after her, and I was the only one who ended up with my skin punctured! I had an off-leash dog come after Chester and Gretel once. The “rule” is that you should not get in between two fighting dogs but what loving pet parent wouldn’t?? It’s just instinct. I’ve had my finger but once but. luckily, that was the extent of my injuries and Chester and Gretel were unharmed. Like you, I am no dog body language expert but I know how to recognize when another dog is not welcoming play. Great article. I have a sweet little female bull dog that was rescued from a puppy mill. I don’t know all her back history, but she obviously is sick of being with other dogs! I always have her on a leash and if we confront a dog off leash I always announce that she does not like other dogs. She is not being aggressive, she’s protecting herself.